a Social Security Card or birth certificate issued by a government authority and a driver's license, a school I.D. with photo or other government-issued documentation establishing identity. Certain other documents are equally acceptable. Please consult a member of the management team and ask them for a copy of INS Form I-9 for a complete list of these documents. 1. I certify that I have read this application and the information on it is complete and correct. I understand that any omissions or misrepresentations are grounds for dismissal. liability and damages that may result from furnishing this to you. employees. At this independently owned and operated restaurant, employment is at-will. This means an employee is free to terminate his/her employment at any time, without reason, with or without cause, and the employer retains these same rights. law. It is the policy of Little Rosie's, Inc., to comply fully with these laws, as applicable, and information requested on this application will not be used for any purpose prohibited by law. 5. 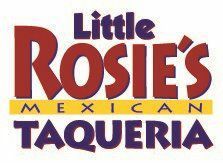 I understand Little Rosie's, Inc., is the employer and does business as Little Rosie's Taqueria. Applications can be given to a manager at the store location or mailed to: P.O. Box 466, Huntsville, Alabama, 35804. Your application is considered active for 30 days; to be considered for a job after that, you must reapply.